Vedic Astrology is a sophisticated tool for understanding how stars and planets affect you. Your natal chart shows your soul’s purpose as well as glimpses into past lives and the future. Jyotish uses the same signs and planets you’ll recognize from Western Astrology, but it uses astronomically accurate data - so you might be surprised at the differences. It’s the mother of evolutionary astrology and the most ancient continuously practiced from of astrology on the planet. Scroll down to learn more. Jyotish, the science of light teaches how the light, gravitational, and subtle energies of the two luminaries and five planets affect us. Vedic Astrology is called Jyotish in Sanskrit, which means the science of light. It’s a sister-science to Ayurveda and Yoga. The Vedas are ancient Sanskrit texts that offer a blueprint for individual and collective spiritual evolution. Westerners are increasingly drawn to the Vedic sciences as we discover the benefits of Yoga, Meditation, and Ayurveda. Modalities such as crystal healing, sound healing, light healing, and aromatherapy all have roots in Ayurveda and Jyotish. Up Next: learn the difference between Vedic and Western Astrology. 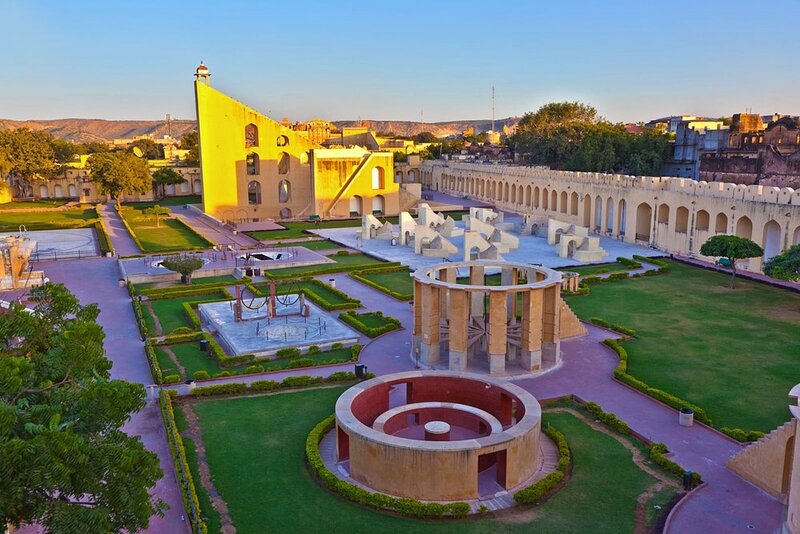 Visiting Jantar Mantar in Jaipur, Rajasthan, India is a profound experience. Completed in 1734, this astronomical observatory is home of the world’s largest sundial. It’s a UNESCO world heritage site and its devices still calculate planetary and stellar positions with accuracy that rivals modern telescopes and computers. How is Jyotish different from Western Astrology? Western Astrology is descended from Babylonian and Greek roots. It uses the Tropical Zodiac which is a precise calendar for Earthly seasons. However, the Tropical Zodiac is no longer astronomically accurate due to axial precession – a fancy way of saying the Earth wiggles and wobbles as it hurls through space at 67,000 mph. One reason your Astronomy 101 teacher might have said astrology is unscientific! Vedic Astrology uses the Sidereal Zodiac which is astronomically accurate. Like NASA. Vedic Astrology isn’t an earthly calendar; it’s a tool par excellence for gauging planetary and stellar influences on your life and on society as a whole. Vedic Astrology focuses on the 2 Luminaries (Sun & Moon) plus the 5 Visible Planets. The five planets that can been seen by the naked eye have a much greater impact on human affairs than more distant planets. Jyotish also emphasizes the role of Rahu and Ketu, “shadow planets” known as the Dragon’s Head (Rahu) and Dragon’s Tail (Ketu). Rahu & Ketu speak to your soul’s evolution and karma for past, present, and future lives. Sanchita, Prarabdha, and Kriyamana. Jyotish and Greco-Babylonian Astrology share a common legacy of Planets and Signs, but Jyotish also has modalities whose wisdom has been lost to the West - until now. The Dasha system (planetary cycles unique to you) and the Nakshatra system – a complete Lunar Zodiac are finally available to Westerners with the renaissance of Vedic Astrology. Remedies. The purpose of Vedic astrology isn’t to fatalistically accept the inevitable! Vedic Astrology offers potent metaphysical tools to help you overcome obstacles and make the best of gifts. Every reading includes remedies tailored to your specific chart. Remedies often include targeted meditations, acts of charity, and balancing your aura with certain crystals, gemstones, or colors.